Too beautiful not to run immediately, this image of the Corona Australis region (be sure to click to enlarge) shows a relatively nearby hotbed of star formation. 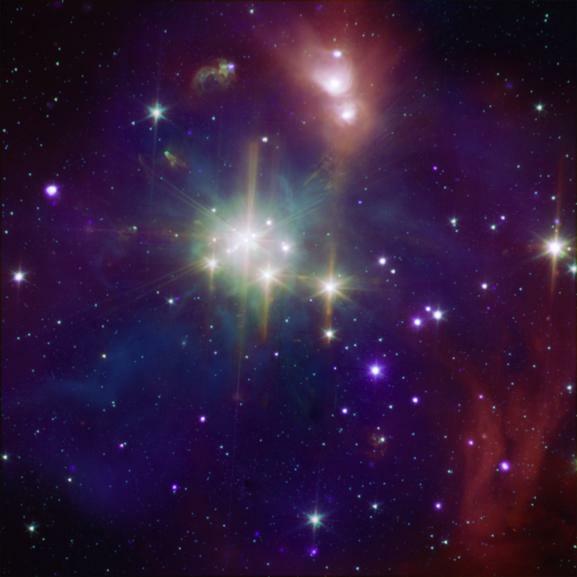 The Coronet cluster at its heart is a loose cluster of several dozen stars, all of them young but ranging widely in mass. Here we’re looking at the Coronet in different wavelengths. The purple areas come from X-ray observations made by the Chandra observatory. The Spitzer Space Telescope contributes its infrared data, shown in orange, green and cyan. Regions like this offer valuable clues to star formation. Credit: NASA/CXC/JPL-Caltech/CfA. [The] concluding argument, that consciousness and the intellectual power of the human mind emerge from the complexity of the brain, and thus cannot be reduced to the functioning of its individual components, leads them to doubt, convincingly, that robots (machines that mimic humans) and cyborgs (man-machine hybrids) will ever amount to more than sophisticated tools, enhancing human life but never replacing it. Centauri Dreams agrees and looks forward to working through the arguments put forth by two powerful thinkers whose take on the future has ever been thoughtful and invigorating. An older title that deserves to be on your shelf is Timothy Ferris’ Seeing In the Dark, a deeply satisfying study of modern amateur astronomy. Those whose roots go back to 3-inch reflectors in the backyard will be stunned to see how powerful the range of amateur tools has become, including the use of CCD (charged coupled devices) for observations that not long ago would have been restricted to professional observatories. Don’t miss Ferris’ PBS documentary on these matters, scheduled to run September 19th at 8 PM Eastern Standard Time. And be sure to check the content-laden support site. A good idea a long time coming: The European Science Foundation, working with other organizations including the European Space Agency, will convene a conference in Vienna to bring scholars from the space sciences and the humanities together. Humans in Outer Space – Interdisciplinary Odysseys will look at the philosophical implications of contacting alien civilizations. Other issues addressed will be how space exploration is presented to the public and engaged in cooperatively by space-faring nations. Participants will discuss historical parallels like these, long examined by historians and ethnologists, in a SETI context when the two-day meeting begins on October 11. This meeting is reminiscent of the 1983 Los Alamos sessions that spawned the outstanding Interstellar Migration and the Human Experience (Berkeley, 1985), whose essays continue to shed light on possible outcomes as we look to human expansion into the cosmos. Interstellar migration can look a long way off when you’re living in a space-capable civilization that seems to be spinning its wheels. But the Google Lunar X Prize should spur those with big dreams and ready cash. Landing a privately funded robotic rover on the Moon is going to be no easy matter, but the first Ansari X Prize showed what could be done by a determined aviation community. Keep the dreamers engaged and great engineering should follow. Centauri Dreams applauds the sheer pluck of this renewed venture and anticipates great things to follow. As a Singularity sceptic, looks like I’ll have to get the Benford/Malartre book, sounds interesting. Hey Google, the Moonrovers Prize was MY idea!!! Even if the intellectual power of the human mind emerges from its complexity there is no reason to suspect that the same sort of complexity can not be created within a machine, inducing intelligence. By saying it is impossible one would be claiming that carbon based machines and silicon based machines are not equal in terms of the problems they can solve. Can a computer simulate the workings of a single cell? Maybe, maybe not. But if it can then why not several billion cells, including all the ways in which they are linked? Also while humans might achieve intelligence through the complexity of their brains, there might be another path to the same sort of intelligence. Two processes/machines that are different but with the same end result. Or, even if a human type intelligence can not be induced within a computer then that doesn’t mean some other type of intelligence isn’t possible. If the answer is that computers can not simulate intelligence then that still doesn’t mean that a singularity isn’t possible. Humans are limited in what they can learn. We have a finite number of years and a finite rate of learning in those years. Alter a human enough and a singularity is still possible. So discouraging. Even with the technology of twenty years ago we could have done so much. Space is expensive to reach but there is no reason why we as a species can’t be putting 1-2 trillion dollars into building up our space infrastructure each year. Moon bases, mars bases, asteroid bases, research facilities,…. And if you think 1-2 trillion is a lot it isn’t. If we were not so interested in killing each other then with 6 billion people it would only be an average of 167-334 dollars per person. The average US tax payer this year is expected to pay 5000 dollars in taxes for the military alone. If we weren’t so interested in killing each other there would be no third world nations so 300 dollars a person would be reasonable. We as a species are our own worse enemy. Benford does not subscribe to the A.I./singularity scenario but he is definitely into radical life extension. I saw him at several Alcor meetings back in the late 80’s and he did write a novel involving cryonics in the early 90’s. Also, he and Michael Rose talk about life extension on thier website as well. In these explorations, I find it shocking that the definitions of “consciousness” and many other words are not established with any scientific authority, and thus everyone is talking apples and oranges. Let the big brains here give their definitions for the following words: mind, consciousness, awareness, intellect, ego, heart, being, non-being, soul, person, transcendence. Then sit back and watch the fist fights start — religious warfare instantly. Unless everyone can agree what each of the above words means, and more, that each word has a different meaning than any of the others, then all AI prognostications are foundationless. With no agreement on the definitions, none of us can answer the following questions in a way that will completely satisfy anyone else here — simply because almost no one has trained themselves to use these words consistently and with precision. If I say a robot is conscious is that the same thing as saying it has a soul, an ego, a life? Why isn’t that a slam dunk for you to instantly answer? Because you haven’t taken the time to be scholarly about it. If this work isn’t done THOROUGHLY, then any conversations are rank speculations of the blind leading the blind. I’ve studied these words for decades. I say with certainty that any AI researcher who has not done some sort of “inner work” using his/her own mind as a laboratory for consciousness experiments, is doomed to failure. Whether in a structured environment like a monastery or as a rogue thinker, a scientist in this field must do this work. If not, then the use of such words will be uneducated, naive and intuitively prone to error. Anyone out there who thinks that sooner or later they’ll make a machine that will think hasn’t thought deeply about thinking. And I mean deeply. “Deeply” means “deeper than Douglas R Hofstadter or Steven Pinker, and those guys are “tops” when it comes to “folks with white coats studying consciousness.” Nope, they can’t cut it either. It takes more than intellect to delve into this field — it requires “feel” also. Einstein knew that feelings about physics deserved his attention. When AI researchers start paying attention to their hearts, then I’ll have hope that they’re on the right track to discover what must be found to begin to “get a handle” on AI. You know, planetary science progressed quite well without an agreed definition of the term “planet”. Plus I note that despite your claims of having studied these terms for decades, and despite your lengthy post, you haven’t offered up your own definitions. I guess you find it more amusing to watch people wallowing in ignorance: those cold rational scientists are so wrong because they don’t listen to their hearts and drift in a cloud of warm fuzzy happy emotion isn’t it hilarious? I’m actually somewhat surprised that you didn’t say that no-one who hasn’t had an acid trip can know anything about conciousness. I mean, New Age woo is loads of fun and all that, and allows you to write lots of stuff without having to know anything, so really, what’s the point? And despite all this personal experience stuff, bear in mind that the plural of “anecdote” is not “data”. I am assuming you are not actually asking me to instruct you. I’m no guru, though I can pretend to be one if you wish. I can swagger like a yogi for ya; probably fool ya that I have “insider information.” But, that wouldn’t do. I can lay out my definitions of words here, but I have yet to see anyone here respond to my previous posts with any interest in these concepts. Pearls and swine, horses and water time. It would take me hours to write it up, and for what? And why do so when I can easily just tell you certain books to read that take hundreds of pages to delineate these definitions. But you, forgive my judging of you, will not read them in all likelihood. If you are a seeker of spiritual truths, I apologize. BTW, I like your concept that many anecdotes don’t add up to data — 50,000 French men can be wrong. I get it. 50,000 hippies chanting “God says XYZ” won’t make XYZ true. If you do want to create a dialog about this issue, probably here isn’t the place to do it. This place is mostly for the presentation of scientifically examined phenomena. It is one thing to say oxygen combines with hydrogen, and quite another to say consciousness is awareness but awareness is something “more” than consciousness. No matter how well tailored the lab coats, science can hardly even say “mind” with a straight face. Mind, UFO, God, — hard to measure such things or even begin to take them seriously. I think geeks are lazy. Like that old joke about a drunk under a street light looking for his keys that he lost elsewhere because the “light is better here,” geeks examine what their tools can observe, but when they don’t have a street light, they often say “looking here is stupid.” Spiritual keys stay lost that way. Geeks love certainty, and the defining of the words I’ve listed involves a loosening of boundaries that they were taught by their parents to be core truths. Ego is not sentient — is not an observer — but everyone is taught that it is, for instance. Toddlers get programmed by their parents — the sins of the father shall be visited upon the child — that sort of thingy. Let me know Andy. If you merely want to poke my ribs with your elbow, well, have fun, but if you do want to try to nail some concepts down, then maybe we can do this via private emails and not bother anyone here about such things. It would take you hours to write up? That’s the problem with New Age stuff, it just goes on and on and on… until no-one can be bothered to accept/refute the arguments because it just takes too long. Conciseness is a good trick to learn here. As for keeping it to email, why? Because you’re afraid of what the general public might say? Or to keep the secret knowledge among the True Believers (it’s more mystically exciting that way)? And as for your comments about certainty, it’s not certainty but a question of communication surely. Hiding away the definitions of words does not help people understand each other, surely? Your attitude is one of derision — if I’m reading between your lines correctly. Okay, it’s deserved karma for me, because I snotted off about how the big-brains are being irresponsible in their scholarship regarding consciousness. If it struck a nerve of yours, sorry. This site is too good to sully it with a flame war, Paul Gilster’s baby doesn’t need the angst, so please, can we keep this to the issues and not “do insinuations?” I started it, so I apologize and intend to do no more of it. Will you please pledge to do the same? If you feel I need another scourging in public here, well, okay, do it one more time, and while you’re tongue lashing, I’ll bite my own, but do try to respond to the issues below. I’ve put forth several statements in this thread that you have not addressed. (Consciousness is awareness but awareness is something “more” than consciousness. Ego is not sentient. Dream consciousness is different from waking consciousness. Awareness is not the same thing as consciousness.) These statements were “beginners’ lessons” in that, if you’d tried to handle them, then some clarity about “definitions of consciousness” would be garnered. It was, in fact, me beginning to communicate and teach what you challenged me to manifest. I’ll try again. How about you see if you can convince me that the following statement is well understood by you — not agreed to, merely understood. Here it is: Knowledge is structured in consciousness. Is that statement true, false, nonsense, what?….to you? How you respond will tell me a lot about “where you’re at” regarding how refined your definitions are. First of all, in my opinion, it would be difficult to find a more concise statement than “Knowledge is structured in consciousness.” I would put it on the order of E=MC2 in terms of the fecundity of the two “equations.” Conciseness I can do for you, but like E=MC2, a formula is worthless unless the underlying research has been done by those trying to determine the validity of the statement. They say only three people in the world understood Einstein when he first came out with his relativity theorems. I would submit that you have not done enough research into “how a mind works” to know if my statement is or is not on the order of E=MC2. Thus, a call for conciseness on your part may be a person who belongs in Class 101 prematurely asking for a graduate level course instead. Secondly, if I were to actually try to teach anyone about anything, repetition would be my strongest teaching tool. E=MC2 was not true or false to most of the world when it was first published — only after a lot of “attending” did the brains-extant begin to “build the neurons” to have the clarity, the matrix within, the point of view of Einstein. His math was right there, but it took a lot of thinking on the parts of some very big brains to come around and study E=MC2 long enough, deeply enough, and REPEATEDLY enough for clarity to dawn in those minds. So far, given that you have not responded to my “early lessons on consciousness,” I am not hopeful that you will “put up with” this need for SATURATION. A concept must be “grown in the garden of the brain” before clarity flowers blossom. I personally have had some astounding experiences in this regard — having gone over and over and over material and then suddenly, BAM! and I “get it.” See Thomas Kuhn for a partial exposition about how a “mind changes,” and you’ll agree that simply stating a truth well doesn’t guarantee its acceptance as such until other minds come to that truth — arriving in Rome — from whatever road they take to it. Again, I don’t think Paul wants an ecumenical council to try to count how many angels are on the pin’s head cluttering up the “hard science” issues. The lessons I would impart here would be too far afield IMO, and thus, private emails would be better. Seed magazine has a 9 page review of the Blue Brain project. Blue Brain is the IBM project to simulate a human brain on a supercomputer. Currently they have simulated one column of a neocortex (of a rat) with 10,000 neurons and 30 million synapses using a 22.8 teraflop supercomputer. (A human neocortex column has 60,000 neurons.) Their simulation uses 400 segments for each neuron and they have precisely researched individual ion channels and biological functions to precisely generate the simulation. Their simulation is generating its emergent results from ground up matching to physical measurements. Previous post: Could Earth Survive Sun’s Demise?